Where do I use my ASDA groceries voucher code? Asda Groceries is a great place to find all your cooking and food essentials in one place. Find all manner of shopping items including food, drinks, health and beauty products, pet products and laundry and household items from big branded names as well as Asda's own range. Enjoy great special offers and regular roll backs helping you to save money on your grocery shopping. Vouchers can be used on Asda Groceries and other products across the store. Online you can use eVouchers on the Asda store which are electronic and can be viewed online and used as part payment when placing your order. There are three different eVouchers you can use, which are gold, silver and bronze. You can use a maximum of 1 gold voucher per order and not in combination with a silver voucher. You can use as many silver vouchers as you’d like but not in combination with a gold voucher. Use as many bronze vouchers as you like and in combination with any other voucher. The free delivery code for Asda Groceries allows you to save money on delivery. As well as this useful code you can find more great money saving vouchers and deals that’ll help you reduce the total price of your grocery shop. Asda has a superb special offers section on their online store which provides great online exclusives on big branded and popular household products. Enjoy rollbacks on a range of items such as Tropicana, Birdseye, alcoholic beverages, Philadelphia cheese, crackers and digestive biscuits, just naming a few! You can also find great offers on expensive products like Cathedral cheese, Surf washing powder, batteries, cat food and meat. The food cupboard offers a great range of food products that don’t belong in the fridge. You’ll probably find all sorts sitting in your cupboards at home with everything from soup to baking powder. It’s always a good idea to stock up on cupboard items and whatever you need you’ll find it in Asda’s food cupboard. Their extensive range of cupboard categories include breakfast cereals, rice, pasta, noodles, tins, cans, packets, crisps, nuts, crackers, biscuits, sauces, cooking ingredients, baking products, spreads, condiments and meal kits. They also have a selection of great special offers to help you save money on your all-important cupboard food. Asda, the winner of the UK's lowest price supermarket award for the past 16 years! 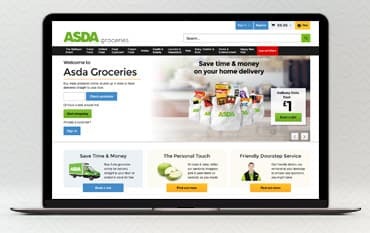 Shopping online has never been easier, simply order online and choose to have your groceries delivered to your home or collect from your local Asda, at a convenient time for you. Don't forget Asda's Price Guarantee, If Asda is not 10% cheaper on your comparable grocery shopping, Asda will give you the difference. Check out their special offers and find all your favourite food brands in one place. For even more savings, grab one of our Asda groceries E-Voucher Codes featured on our deals page right here. We are constantly on the hunt for first order E Voucher Codes for ASDA groceries to help you with your money saving. Our experts check dozens of sites for secret codes including NHS discounts, student sites & social media channels saving you time & money!